Swami of Sadguru Vishwatmak Jangli Maharaj Ashram, Kopergaon visited our shelter home, adoption center, Childline, Snehjyot-Mukta, Balbhavan etc. met the inmates, and taught them the techniques of Dhyan and self-empowerment. 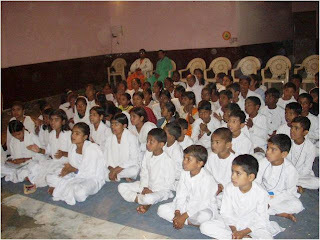 The Janglidas Maharaj Ashram runs more than 50 schools and hostels in the various states. About 2 lakh disciples have taken Anugraha Deeksha from Maharaj and are following the principles of unity of soul , non-discrimination and equality. The disciples are also from many European and Asian countries. The team of Snehalaya had visited the schools and hostels of the Ashram and invited Maharaj to Snehalaya. Snehalaya requested Maharaj to conduct sessions from month of June 2010 to the worthy children from red-light areas and slums. Snehalaya can accommodate more inmates in campus after the project Himmat Gram at Islak gets completed, said Mr. Milind Kulkarni while offering vote of Thanks. Paramanand Maharaj, Sacchidanand Maharaj, Dada Naik and other eminent associate of Maharaj were also present. Hostels are also a great place to meet other travelers.